The classic role-playing game of horror in the face of ancient elder monstrosities rises from the depths to drain the sanity of mortal men in a brand new edition! Concepts: Take on the role of an investigator as you become involved into a mysterious adventure in the height of the 1920s (and beyond), based on the horror fiction of H.P. Lovecraft. The first version of the Call of Cthulhu role-playing game was released in 1981. In the 35-plus years since then, it has seen multiple editions, often with little in the way of large-scale sweeping changes to the game’s mechanics. This is something of a testament to how sturdy of a game it is! In this new edition, we see some of the largest changes to the system yet – a brave move in an attempt to bring Lovecraftian horror to life. Writing: H.P. Lovecraft grew to fame for his unique take on cosmic horror, weaving tales of unknown and alien entitles that existed hidden and secret in far reaches of the world. His work, while problematic (and considered racially regressive even at the time of original publication) was impressively unique in how it handled horror, emphasising the damage that the supernatural posed to mortal sanity and emphasis on the otherworldly and alien rather than the spiritual world. With stories based around investigating and mystery, this has always been prime ground for role-playing game for people who prefer puzzle-solving over dragon-fighting. This particular edition incorporates excerpts from Lovecraft’s writing and various other authors who have written on the Mythos in order to create a strong atmosphere. The explanation of the rules is clear, concise and well-delivered, and the book contains enough sections covering anything from cursed books to alien beings to arcane spells and historical setting eras to feel extensive and thorough. The writing in this edition is easily as strong and tight as in any other, well-polished and clear. 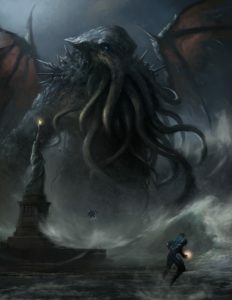 Also included are several brand new introduction scenarios, which are excellent – it does feel slightly unusual to have a Cthulhu rulebook without the classic ‘The Haunting’ scenario present, however this is available in the quick-start pack, and the ones that are included, ‘Amidst the Ancient Trees’ and the chilling ‘Crimson Letters’, are fantastic choices for the place. Mechanics: Throughout the history of the game, our core mechanics have changed little, based as they are on rolling a d100 percentile in the aim to score higher than the skill that you are attempting to deploy. Rather than trying to reinvent the wheel, this edition incorporates several of could best be classed as quality of life improvements. One of these is the capacity to ‘push’ your roll, which is much appreciated in games that have a binary pass/fail system like this – if a roll is failed, the player may attempt to re-roll it, one time only and at the risk of a more severe failure. That’s a fantastic addition to the ruleset. Character creation contains several changes, all of which are for the better. Characters are still composed of primary attribute numbers which are determined via dice rolls, and a number of skills which are bought with points. In previous editions, skills were rated as a percentage whilst attributes were scored from a range of 3-18, the attributes in this edition are now calculated by percentage instead. This has a knock-on effect of unifying the gameplay quite a lot. In challenges, players can be asked to roll against either their skill value (attempting to roll under their skill score on a percentile dice) or, should the situation be more difficult, half or even a fifth of that value – this serves to allow the game to possess a more flexible range of difficulty, and although it takes more time to fill out these numbers on the character sheet it streamlines the game considerably. Three other changes to previous editions also stand out and are worth mentioning. Combat, which is a skill role much like any other, is now a simple contested action with the two opposing characters. This means that players can opt to dodge out of the way of a monster’s attack, or even try to fight back, with every round of combat; nobody simply stands by and gets hit. This makes combat faster and significantly more brutal, perfectly in keeping with the style of the setting. To help give some small level of survivability, players have a ‘wounds’ box – a tiny buffer that exists when they would normally take a lethal amount of damage which instead allows them, once only, to sustain a severe wound but keep on living. Characters in Call of Cthulhu are fragile things against the unnatural horrors that surround them. The last change that I want to mention is an optional rule relating to the character’s luck rating. Like health, sanity and magic, luck is a rating which can be rolled against during the game, but an optional rule exists to allow the players to spend their luck. Doing so lowers their luck score by one – permanently – but allows them to raise the number on the dice they rolled by one. They can spend as many points of luck in this way as they like, meaning that this way is a great way for them to barely scrape through a situation in which they failed a roll by only two or three. Or they can try to save it for a cataclysmic failure at the end of the session, if they have enough left. In this way, luck becomes a resource to manage, if the players are willing to risk it. In terms of campaign and one-off adventure play, Call of Cthulhu has always been a game that is quite brutal. Characters tend to get chewed up and spat out – sometimes literally. This matches the setting’s concept of the fragility of humanity, and it is understandable that this may not appeal to everybody, especially players who may prefer to form long-lasting bonds with their characters. With many of these changes, the potential for long-lasting campaigns is given a much-needed push and becomes far more viable. It’s also worth noting that the game includes several other rules, all of which work quite nicely. There are rules for penalty and bonus dice, which can improve or lower your rolls should you wish to use them – these rules feel slightly extraneous, but are nice to have should you wish to reward a player who has formulated a strong plan of action or give a lingering penalty for a severe wound that someone sustained. The game also incorporates some optional tables which can generate a background for a character, which we have had some fun with and would recommend trying out, even as just a simple basis for a more developed character. The game also features rules for chases, both on foot and vehicle based, but they feel slightly more cumbersome and have yet to find much play at our table. 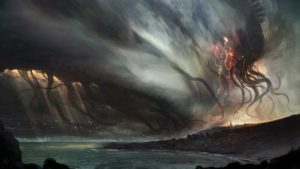 It’s worth stating that Call of Cthulhu has one of the most flexible rulesets around, so players and GMs never feel required or mandated to use any of the rules that they don’t click with. Design: The rulebook (specifically the Keeper’s Manual) is a lush, beautiful book. Full of vibrant, moody and atmospheric full-colour artwork and illustrations, the book is a visual feast. The binding is strong, with a handy bookmark ribbon included. In terms of layout, the book is intuitive, with chapters presented in a sensible order with the information made easily accessible with a minimum of page-flipping. The text is clear to guide the reader to the right sections whenever necessary, and the appendixes include all relevant tables and summaries. As well as that, the book simply looks very good on the shelf. It’s a strong testament to how a roleplaying game book should be designed and presented. Playability: Call of Cthulhu has always been an exceptionally flexible game, with a huge variety of settings available such as Roman era, dark ages and so on. This is due to the impressive level of flexibility inherent in the mechanics, and this edition follows that standard nicely by incorporating both classic and modern setting details. This includes a full list of possible equipment and items, but also thoughtful approaches to the differences in how social classes, racial issues and mental health treatment are contextualised within their respective eras. In previous editions, the amount of points available to allocate into skills was determined solely by a character’s education score, which meant that characters with low education were somewhat hampered, meaning that some character could be easily outclassed by an aged professor with a suitably wide range of hobbies. In this new edition, available points are determined by a mix of education and other relevant skills – sometimes strength (possibly for military servicemen), sometimes appearance (for entertainers). This does add very strongly to the playability of the game, giving characters a much more even start. However, the number of available occupations does feel just a little limited when compared to the book’s page count, and could readily benefit from another two pages of sample occupations – or better yet, a guideline on how a GM can calculate their own occupation to ensure that it maintains the same balance as others. Conclusion: Call of Cthulhu has long been one of our team’s most beloved tabletop RPG games, with a huge broad canvas for fantastic tales to be told. With several previous editions making only small adjustments here and there, none of us expected quite the amount of changes that were introduced in seventh edition. It does strongly appear that many of the changes were based on modifications and ‘homebrew’ improvements – several published 5th and 6th edition adventures included, for instance, suggestions for incorporating difficulty levels into the game. If anything, 7th edition feels very much like a culmination of all of the game’s historical innovation that preceded it, but with a decisive push to continue moving forward. 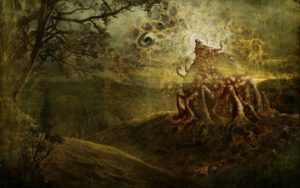 FINAL THOUGHTS: A fine polishing of an already solid system which brings the Call of Cthulhu game into the cutting edge of modern gaming.